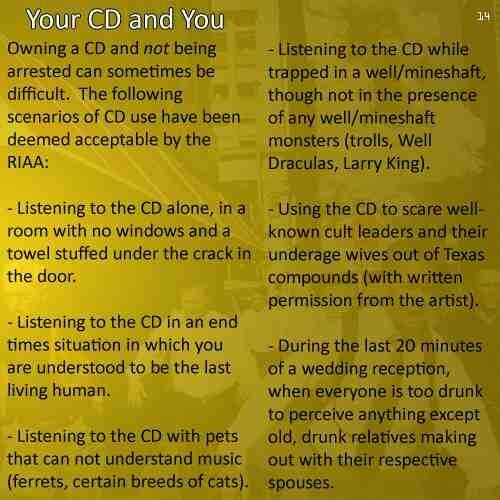 The RIAA has done gone lost their minds. Not really, actually I got this from Boing Boing. Still, you believed me for a sec didn’t you? The music industry is flopping, gasping, dying. I will be loudly drunk wearing a party hat at and stained hawaiian shirt at the funeral. David Byrne has some smart things to say about it at Wired. Yes, I know, another post of content boosting, but substantive blogging is hard work. More real content, for those of you who like that, very soon. Also, we got a mailing list! Sign up and we will send you tasty spam, that you want to read, I swear. Prev Post: CAN I HAZ WEBSIET?!? !1?